Finally Czech Statistical Office has released complete data from 2008. Many countries, many travellers and many travel companies have been affected by financial crisis. Especially industry of tourism has to challenge the crisis on the first place because the first personal budget constrains were imposed on family trips as well as on business trips. Frommers review: With its excellent view of Prague Castle, the Bellevue is my perennial top choice. The ambitious owners (who also run Vinárna V zátisí and Mlýnec, both reviewed below) have put all their energy into the Bellevue's intelligent menu: beef, nouvelle sauces, well-dressed fish and duck, delicate pastas, and artistic desserts. For a tamer but extraordinary treat, try the filet of fallow deer. Al dente pastas share a plate with lobster-and-spinach purée, garlic and herbs, or tomatoes and olives. The greens on the side are always fresh and never overcooked. Desserts feature hot bitter chocolate tart, or wild berries in port and cognac served with vanilla and walnut ice cream. The consistent food and presentation and the pleasant and perfectly timed service make your meal at Bellevue one to remember. Chosen Tripadvisor review: Huge number of flavors that enhance, but don't overwhelm - melting venison carpaccio: sweet, soft, crispy duck with cabbage and dumplings: deconstructed apple strudel. Nice half bottle of Moravian Red wine recommended and enjoyed... and according to my partner good vegetarian (if small selection). Frommers review: Without a doubt, this is one of the city's best dining spots. It is housed in an Old Town corner building and has a minimalist interior. Three different seven-course menus are served, with a focus on diners' sampling an array of both food and wine. The Boheme Bourgoisie menu provides a spin on classic and modern European food, while the Boheme Continentale offers a tasting of smaller and simpler dishes. 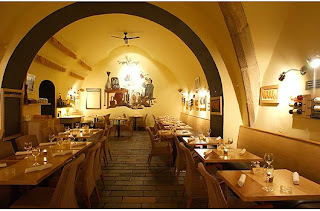 The Boheme Traditionnelle menu finds inspiration in old Czech cookbooks, and successfully raises, by miles, the level of Czech classic cuisine served in restaurants here. Each dish is accompanied by an excellent selection of wines served by experienced sommeliers. This unique experience is simply worth the money. Chosen Tripadvisor review: Best meal I have ever had. I love tasting menus, but sometimes there is a compromise between the look and the taste of a dish. This restaurant has it all: ambience, style and substance. We chose different menus with accompanying wines and took three hours to savour everything that was put before us. I think they also do a shorter pre-theatre menu. The staff were delightful and very knowledgeable. I would go back to Prague just for the pleasure of eating at la Degustation again. Frommers review: Best described as "Bellevue Light," this laid-back version of our riverfront favorite provides the same quality and similar ingredients, with a few lighter choices such as the vegetarian dish gratinéed tagliatelle with broad beans. There are some fish choices as well. V zátisí ("still life") has a casual elegance, like the living room of a beachfront Mediterranean villa, with cushy upholstered wrought-iron chairs and plenty of artfully arranged flora. Chosen Tripadvisor review: Amazing food, very nice restaurant with very helpful and friendly staff. It is a bit upper scale, so its a bit expensive, but still food was amazing, tried the bohemian sampler (Duck, deer and beef) which was delicious, especially the deer, although the portions were quite small with the price high (695 Kr). They do have meal combos for 3 course meal running at about 999 and they have wine coupling as well. Overall good, but a bit price. 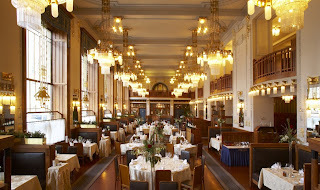 Frommers review: An afternoon here feels like a trip back to the time when Art Nouveau was the newest fashion, not history. The reopening of the entire Municipal House in the spring of 1997 was a treat for those who love this style of architecture, and the restaurant and kavarna might be its most spectacular public room. Witness the lofty ceilings, marble wall accents and tables, altarlike mantle at the far end, and huge windows and period chandeliers. Coffee, tea, and other drinks come with pastries and light sandwiches (for kavarna). Chosen Tripadvisor review: The restaurant has a fantastic setting in a beautiful room. The meal was ok to good, BUT....You are offered a glace of champagne before getting settled at the table and before seeing the wine list. BEWARE, at 500 crown (nearly £20) per glass!! The wine menu is not offered until after you've ordered your food. When you see the prices, you'll know why! Also, check your bill, as they tried to add an extra 700 crowns to an already large bill. Good food, but be warned. Frommers review: This pasta joint on the Royal Route, just off Old Town Square, is one of the best of the Ambiente family of "living restaurants." While Ambiente's Vinohrady locations once warranted the trip out of the city center for what used to be the only ribs and Tex-Mex in town, other joints have since caught on to ethnic menus, which go beyond the basic Czech fare. What this outlet on Celetná offers is location, location, location, and usually enough tables to satisfy the endless tourist rush hour. In a candlelit basement trattoria, the menu is limited to pastas -- albeit served about 50 different ways -- salads, a few meaty entrees, and garlic bread if you're still hungry. Chosen Tripadvisor review: Was back in Prague for second time in October and booked this restaurant for almost every night of our stay! The food is amazing and so reasonable! Homemade pasta-pasta will never taste the same after! Cannot recommend this highly enough and would advise booking ahead. When you walk through Prague you can feel how old the streets, bridges, castle or squares are. 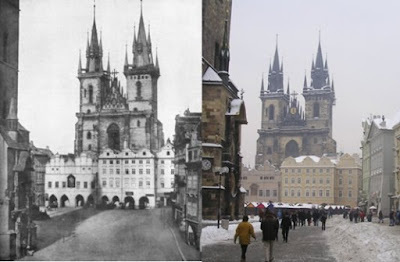 Surely you are wondering how Prague looked like in the past. And now we are coming up with our series about history of Prague. During our trip to the history we will visit various spots in Prague. We will see the differences between present pictures and those from the past. You will be able to get an insight of Prague history and its changes during centuries. We hope you will enjoy the trip together with Prague City Apartments. For today’s trip Staromestske namesti (the Old Town square) was chosen. Staromestske namesti is one of the most famous tourist spots in Prague. Featuring various architectural styles including the gothic Týn Cathedral and baroque St. Nicholas Church, the spacious square is an oasis for travelers wearied by Prague's narrow streets. Among many churches, tourists may find the Astronomical Clock on this square, while the tower at the Old Town Hall offers a panoramic view of the Old Town. The first view is focused on the Old Town Hall. 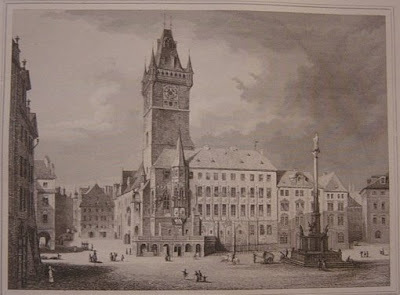 The picture is from 1841, graved by J.Poppel, and it shows how the Old Town Hall looked like before 1838. The Old Town Hall was rebuilt in the next decade; however, this new part of the Old Town Hall was completely destroyed in the end of the Second World War. Only a small part of the previous building has remained (see small pink building next to Old Town Hall tower). There is a discussion going on presently about rebuilding the destroyed part of the Old Town Hall. Nothing has been decided yet. The old picture dates back to 1856 and it was taken by Andreas Groll. It is probably one of the oldest photos of Prague. Next two pictures show the Old Town Hall tower. The first one dates to 1856 and it was taken by Andreas Groll again. 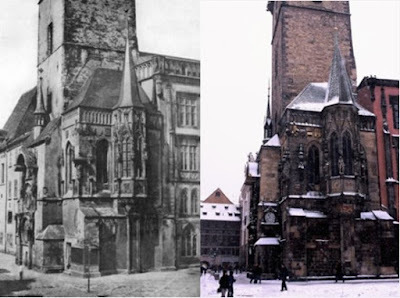 You can see by comparing these two pictures that this part of the Old Town Hall remains unchanged since then. In this picture you have a broader view of the square and here again the author is Andreas Groll and the photo dates back to 1856. The only bigger difference between the new and the old is the presence of tourists :). The last picture of the Old Town Square is a view of the south. It is proof of that various architectural styles are represented. The picture came from 1865 and its author is F. Fridrich. The statue in the front was called Mariansky sloup (Marian Column). A crowd led by Frantisek Sauer destroyed the statue in 1918. F. Sauer and his followers considered it a symbol of Czech defeat in Bitva na Bile hore (Battle of White mountain).